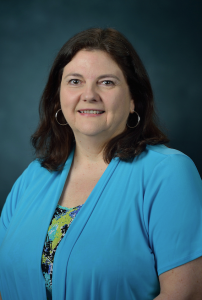 As the first female department chair in the University of Mississippi School of Engineering, Dawn Wilkins brings both experience and expectations to the position. Wilkins is already working to build upon the foundation laid by her predecessor, H. Conrad Cunningham, who retired this summer as chair of the Department of Computer and Information Science after leading the department to new heights over the last 14 years. “In the short term, I’d like to expand our offerings for Honor’s College students, support the proposed new minor in digital media studies and build an active learning lab to provide additional hands-on opportunities for our CS majors,” Wilkins said. The department has been working with faculty from Art, Journalism, the Center for Writing and Rhetoric and the J.D. Williams Library to create a new minor in Digital Media Studies. This minor, if approved, will provide opportunities for students across campus to expand their knowledge and skills in all things digital. Wilkins also has plans for further down the pike. Wilkins previously served as the department’s undergraduate program coordinator, graduate program coordinator and as acting chair during Cunningham’s two sabbaticals. Still, Wilkins acknowledges there are challenges to be overcome. The goal of the meeting is to increase awareness of high school and college-age women about the opportunities in computing. SAP is helping to sponsor the event. “I hope we will be able to have many of these kinds of events until they are no longer needed,” Wilkins said. Wilkins is calling for the entire university community to assist in attaining her departmental goals. She has won the School of Engineering Outstanding Faculty Award and its faculty service and teaching awards. Wilkins has also been active in research and publication and service across campus. Twenty years ago, Wilkins joined the UM engineering faculty as an assistant professor. Six years later she was promoted to associate professor with tenure. A few years afterward, Wilkins became a full professor. “Dawn drew our colleague, Yixin Chen, into the statewide National Science Foundation EPSCoR project and, together over the past five years, they have built a successful program that has supported several graduate students and resulted in many publications,” Cunningham said. Wilkins’ sections are among those that students rate the highest. Her elective courses are among the most popular offered each semester. She is sought out by many students to be their project, thesis or dissertation adviser. She has been the adviser or co-adviser for four Ph.D. graduates and numerous master’s degree students. Wilkins is the longtime adviser for the student ACM chapter, has served on the leadership of the Faculty Senate and many other committees and organizations on campus. She has reviewed National Science Foundation proposals and is a founding member of the leadership of the Mid-South Computation Biology and Bioinformatics Society. A native of Springfield, Illinois, Wilkins earned her bachelor’s degree in mathematics from the University of Illinois at Springfield, formerly Sangamon State University. She taught seven years at Illinois College before earning her doctorate in computer science from Vanderbilt University.